Yeovil Town Ladies are set to enter administration and say they "recognise" they will not be a Women's Super League club next season. The Football Association confirmed the Glovers, who are bottom of the table, would be deducted 10 points with immediate effect. Yeovil became a full-time, professional club for the first time last summer. However, they have already made cuts to their staff and are considering reverting to part-time status. There are five games of the season remaining and the deduction leaves the Somerset side on minus six points, 15 points adrift of safety. Yeovil play 10th-placed Everton on Sunday and if they fail to beat the Toffees they will be certain to finish bottom of the league. 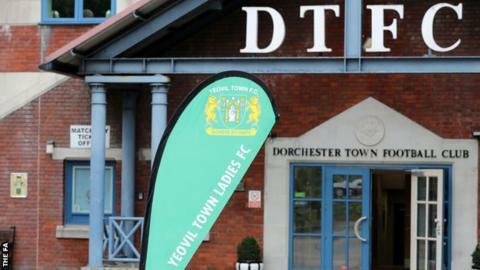 "Yeovil Town Ladies have accepted the decision of the FA to impose sporting sanctions on the club due to the financial difficulties which were announced earlier this month," the club said in a statement. "However, through the commitment of the directors and others and the support of the FA, who have been able to advance next year's funding to us early, the club is pleased that it will complete all games this season and so there is no necessity for any further formal insolvency process to continue. "The club is now looking forward to establishing itself in the Championship next season and once again building its future on and off the field." Kelly Simmons, the FA's director of the women's professional game, added: "We are saddened by today's news. Yeovil Town Ladies FC has a long history in women's football and we will do everything we can to support the club during this difficult time. "However, we are pleased that we are able to give Yeovil Town Ladies FC the support they need to continue in the WSL for the remainder of the 2018-19 campaign. "At the end of the season we will have further consultation with the club to agree the next steps and understand how we can best support them going forward." Yeovil would not be the first top-flight women's side in recent years to see financial problems contribute to them dropping out of the WSL.